We woke with the sunrise on the Great Wall, and went back to the truck to get set up for the day ahead. We had to fill Ivor’s water tanks, and then set off to cover a fair distance. There was a midday stop to see a sleeping Buddha that was quite frankly huge – whoever had put it together had surely earned themselves a good few Buddhist points, and would be a couple of steps closer to exiting the ‘wheel-of-things’. Though the statue was indeed massive, the highlight to our little break point was actually the area in which it was set – a tranquil garden right in the middle of the city of Zhangye. We continued to the town of Minle, and for the first time we were forced to take a hotel when we were supposed to camp (the hotel parking was not suited to us snoozing in the back of Ivor) – so to work off a little grumpiness we took out the bikes and headed for the hills. It worked out perfectly, as the clouds that had plagued us all day disappeared and we found a great trail that snaked its way up the lush hills to a marriage site (we think) with ornate buildings laid out in front of a gorgeous mountain backdrop. Certainly by the time we had reached the bottom of a stunning 4 kilometer decent the troubles of the hotel nonsense were well and truly behind us. On the way back to town we even found that in making a new course for the spring melt, the construction workers had managed to make a huge mountain bike friendly half-pipe that Vaughan could not resist. That night we dined on hot-pot, which is a favourite of the region where each table has a burner on it, and a pot of boiling broth containing a very generous helping of chillies and oil. Plates of raw food are then plucked from the fridges, and then cooked by the diners – who, if they are not native chop-stick users, then repeatedly drop the food back into the pot and splash themselves with boiling chilli oil in the process. The restaurant staff had been very attentive and friendly throughout the meal – they all wanted to take it in turns to look after the funny white buffoons that were blundering their way through the whole process. 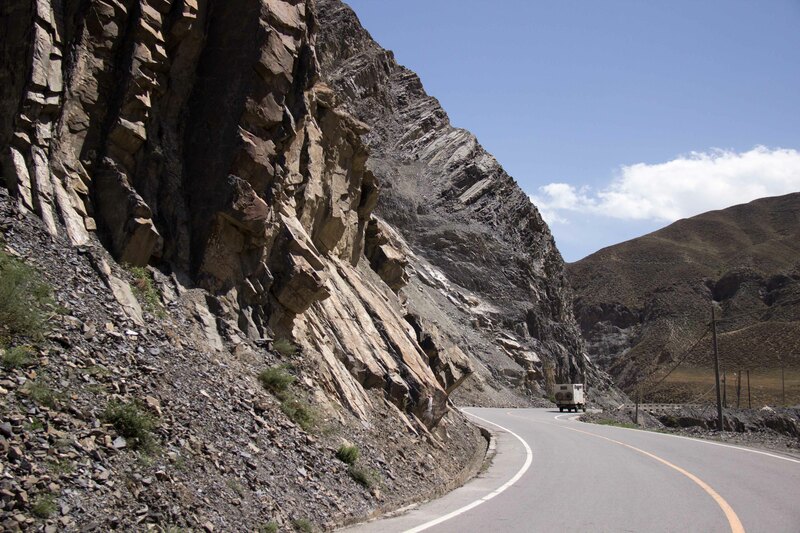 Today’s drive would be one of the most scenic of the trip through China so far – we were now rising up into the mountains and skirting around the area where Han Chinese culture transforms into that of the Tibetans. With a lifestyle that was in many ways more simplistic, the people and their demeanours changed also. 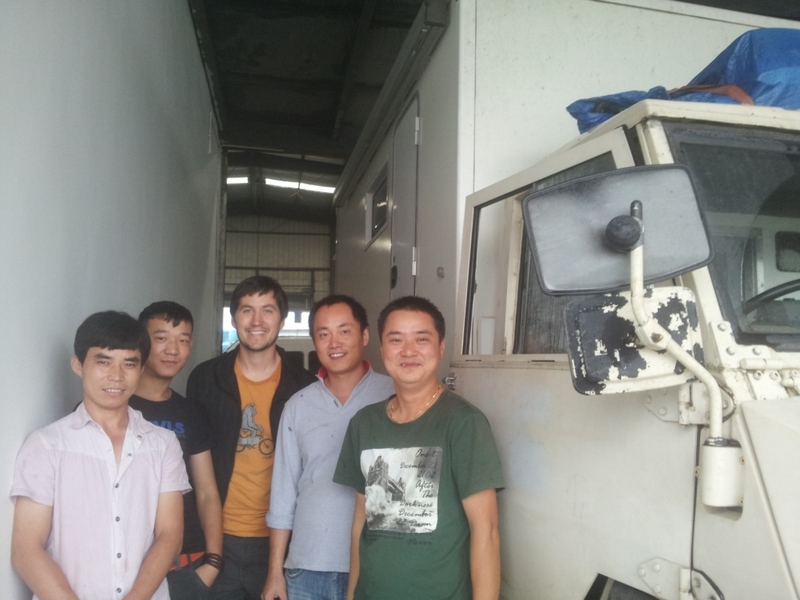 Faces were more smiley, and the reception even more friendly and personal. Almost every child would wave upon seeing these funny white faces looking back at them. 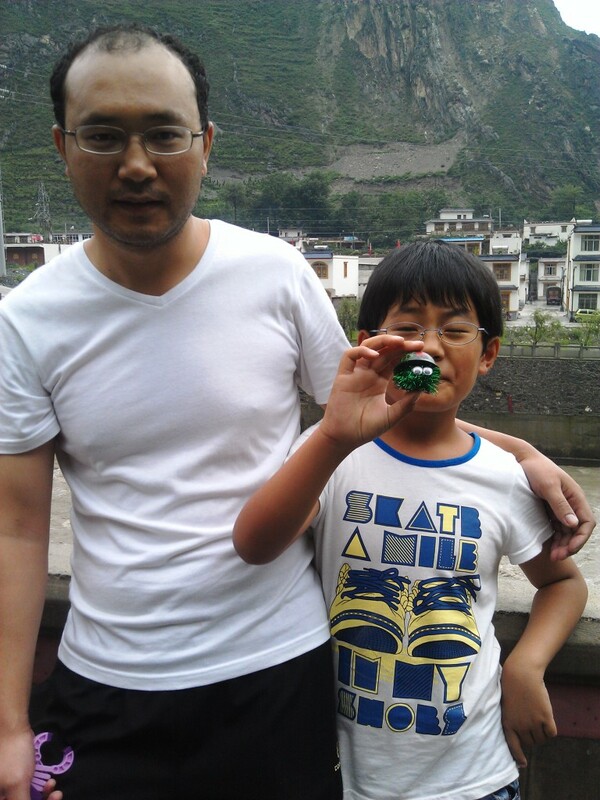 We stopped off in a small village to buy some Yak yogurt from a roadside seller on the way – Lun insisted that we try it, and it was actually quite palatable when dosed with enough sugar. We finished the day at Huangzhong, went for some cheap eats with Lun, and had a walk around the monastery after dark for which the village is famous. We were up nice and early to go and check out the Taer Shi Monastery in daylight, and found it to be impressive. And unlike our previous trips to Buddhist sites – was actually full of practicing Buddhists, rather than just being maintained to keep the tourist money flowing in. The deep red of the lamas robes was everywhere, with the lamas sedately going about their prayers and rituals – though the effect was taken away somewhat when a lama would reach into their garments and answer the mobile phone that was disturbing the peace. Lun explained that to win back the favour of the people, the Authorities, since they had legalised religion once more (realising that they were at risk of an uprising should the ban continue), now invest heavily in Bhuddist culture – which transformed the life of a typical monk almost instantaneously. In the eyes of potential recruits, the lifestyle changed from a devoted renouncement of all worldly goods to a financially attractive proposition overnight. We had another blissful drive through the scenery, and that night Lun agreed that if we were within easy reach of the precious ones hotel we could camp again. We found a spot down by the river just outside the town of Tongren. Onwards through the ‘Tibet Cultural Region’ to Langmusi. Other than some churned up roads, that Boris and his pilot Jon had to negotiate with care due to the broken spring, it was uneventful driving (generally the best kind). These contraptions are all over the place – A cart hung off the back of a rotavator, with tyres added! We stopped midday in Xiahe to visit another monastery – and paid to get in this time so that we could climb right to the top of one of the pagodas and get a view out over the whole town. We got to Langmusi mid afternoon, and after a quick look for a campsite decided to give up, since the tracks were too rough for Jon’s stricken vehicle. After some cheap Chinese eats (either rice or noodles with a concoction of meat and veg, as per normal), we settled down for a night in the hotel car park where all the bikers were staying. A soothing horn blast rippled through the hotel at 6 in the morning. Then half an hour later, the tranquil car park had been transformed into a parade square. 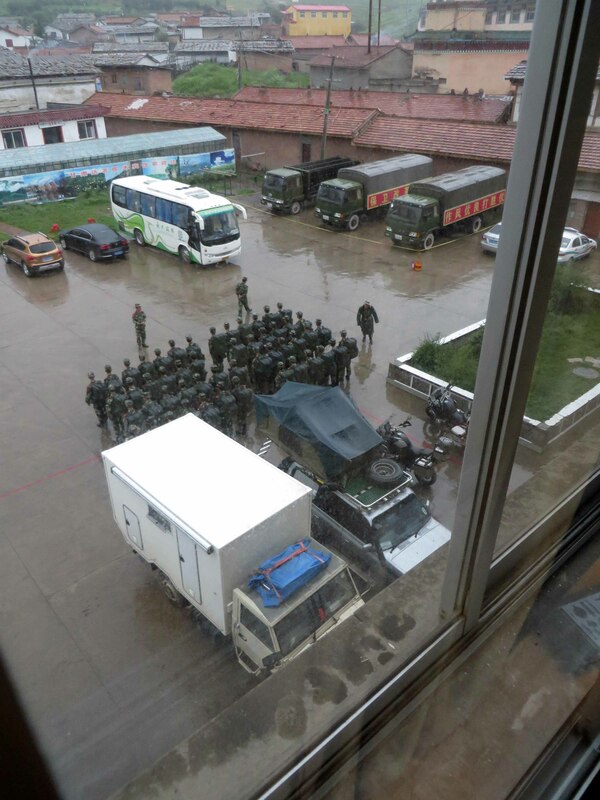 The hotel was home to a fair number of Chinese troops – and their morning regime woke us up with a jolt. The rhythmic stomping and regular barks from their commander was not a good start to the day. For the record, looking out of your bedroom window to find squadrons of the military Chinese quite literally feet away from you is not an experience we wish to repeat. This kid came over with a family that had come to see what we were about. He Just wanted to hang out in the truck, and climb up the ladder a few times. To ease the burden of carrying Lun we had been swapping people around the vehicles, so that either Vaughan or Kim would take a ride in Jon’s Land Cruiser when Lun sat in Ivor. The luxury of the comfortable leather seats and air conditioning had nothing to do with it. Honest. It was Vaughan’s turn this morning, and he was lucky enough to witness Jon driving his delicate truck very carefully… into an open manhole. The town was receiving a make-over, and there were plenty of little obstacles to keep drivers on their toes. After the rude awakening in the car park, Jon’s bleary eyes missed this particular trap, but miraculously after reversing out, Boris had suffered no further injuries. The challenges of the day would not end there though. We were crossing the plains during a season where every herdsman moves their livestock – be they goat, sheep, or yak – in the search of fresh pasture. It is no exaggeration to say we lost hours to these migrations today. The animals are deaf to the dulcet tones of a car horn – so it was lucky that we had left Ivor’s siren in place, back from his days as an ambulance. Animals and Herdsmen alike jumped when it went off, but it did eventually get the message across that we were coming through. We dispatched the last of the herds from the highway by midmorning, and were left with good roads and great scenery as we descended through a deep river gorge towards Maoxian. Ivor was clearly loving the gravity assisted driving, as he regularly insisted on pulling multiple overtakes on the way down the valley. The Lunster once again said we could camp, as long as we didn’t stray too far from the precious ones hotel – so we found a national forest park and set up there, getting an early night so that we could be up early the next morning. 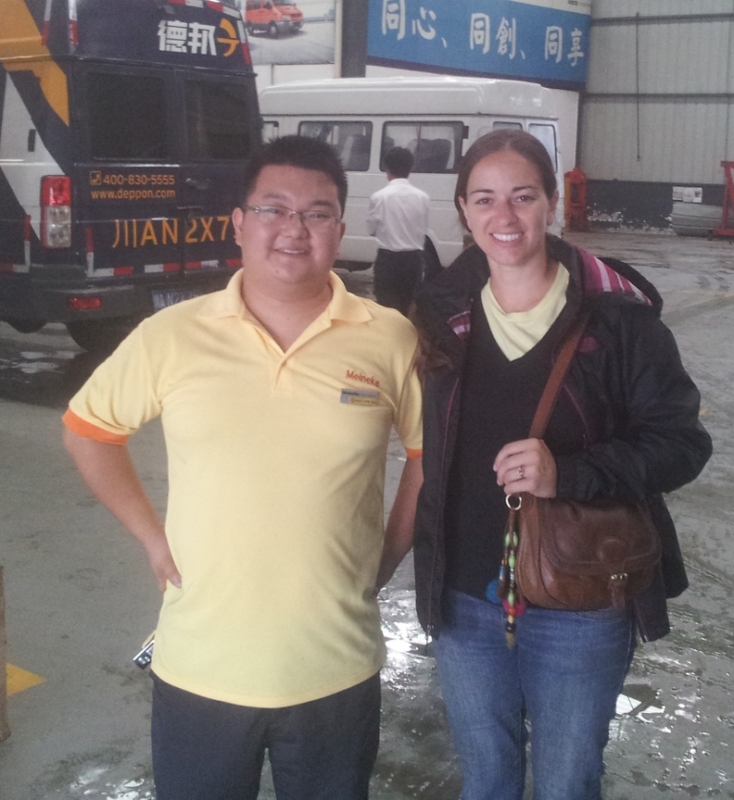 Partly so that Jon could head towards Chengdu and get a head start on getting his truck fixed – but mainly (in Vaughan’s eyes), because WE WERE GOING TO SEE THE PANDAS!!!! Little did we know it, but we were in for a corker of a bad day. It’s not often you get this much bad luck in one place. Up early, as planned we were on the road at 6:30, quite some feat for us on holiday. We picked up Lun from the hotel, and sneaked in to the buffet breakfast for some noodles and fried rice (typical Chinese morning food). Ten minutes after leaving Lun’s hotel we came up on a huge queue of trucks. We thought nothing of skipping down the wrong side of the road, since the police had a habit of holding back large vehicles so that they don’t block up towns / narrow bridges etc. In this case we were sadly mistaken and found two earth movers at the front of the queue. They were busy hacking away at a landslide that had blocked the road, and the entrance to a tunnel – it had been brought down by the torrential rain that had hit us the night before. There was no way a car could get past, but after the first few hours it would be possible for motorbikes to squeeze through. We sent a message back to the bikers, who duly arrived and made their way along the road. We had made the best of the delay to be honest, making friends with locals and attempting to hold a small dance party in the street – but still, time was dragging on. After having been held up for the best part of 5 hours (the pandas already fading from Vaughan’s view), we finally got on the way – it was a bit of luck that we’d cheekily skipped the whole line, since we were now sitting pretty, nearly at the front. 10 minutes later Kim received a text: David has crashed in a tunnel, and he had broken his leg. 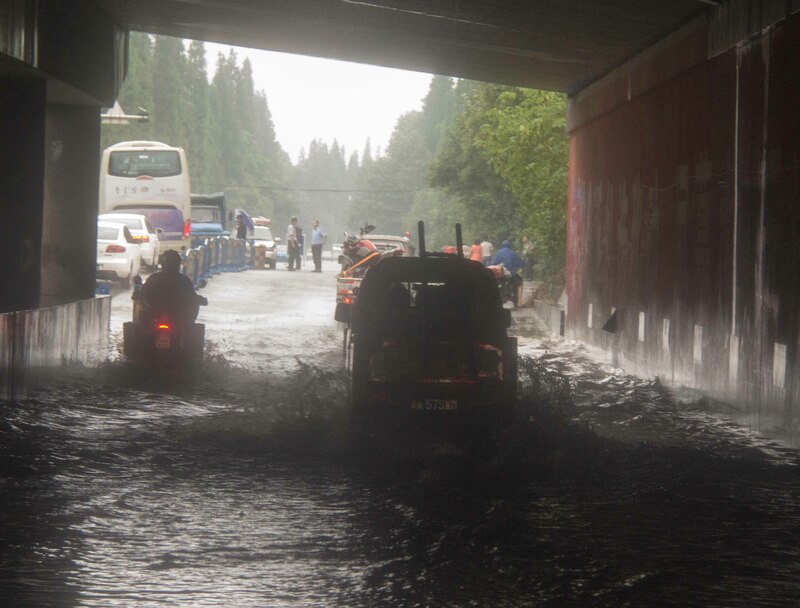 The torrential rain had started again, and on the rough concrete surface inside a tunnel some spilt diesel claimed one of the bikers. He was lucky, in a way, since one lane within the tunnel had been closed off with road cones, so he had somewhere to crawl to. And also, that the landslide upstream had dramatically reduced the number of road users on that particular stretch. Were it not for these two factors, we all agreed afterwards the outcome could have been a whole lot messier. It was the best part of an hour before we caught up with the rest – David had already been taken to hospital by a couple with a car who had stopped – he was on his way to hospital, though it was not clear at the time which one. The guys had also managed to flag down a small truck to load the bike into, so that we could attempt to get it closer to town. Lun and Jon eventually managed to locate David, and through a couple of different trucks we managed to get his bike to the outskirts of Chengdu. The Chinese medical system is more haphazard than the ones us western folk are used to. Medical care is provided to those who can pay for it, so until someone came to Davids’ aid he was stuck in a crowded waiting room, and badly in need of painkillers at the very least. The diagnosis was a broken hip – he had compressed the ball into the socket, and though the fractures were all very small, the joint would have to be replaced. Believing that he was covered for repatriation with his insurance, David was keen to get sent home to Oz if it was at all possible. Another quirk of the medical care in this country is that there is very little by means of nursing staff, it is left to the patient’s loved ones to do all the dirty work. Having no ‘loved ones’ in the vicinity, Jon and Clive even had to step in to hold David up as they plaster casted his hip to give it some extra support. It was suggested that David might be able to get a flight out that very evening, but everything took too long, hopefully he would be able to escape tomorrow. We finally checked into a cheap Chengdu hotel late that evening, fully exhausted by the day but grateful that it had not been any worse. … So we set about looking after Ivor instead. We asked at a garage if they could look at the brakes – A very kind guy apologetically said that they couldn’t since they wouldn’t have any parts – but he hopped in his car and lead us to the Iveco garage, where he spent the rest of his lunch break with us making sure that all was good. We treated the truck to another engine oil change, and had them try to stop the howling brakes. They still had no parts to replace, so gave a quick rub down of the shoes, which should stop it for another thousand kilometers or so. Everyone was intrigued by the strange white folk again, and some other customers even took turns at sitting in Ivor’s driving seat to have their pictures taken behind the wheel – it was mind boggling to them that the driver would be on the ‘wrong’ side of the car. The rains that had been hounding us continued, and the water level outside the garage rose a few inches just in the hour we were there. This was a bad time for Kim to find out that she had dropped her phone outside – by the time she found it the water was a couple of inches deep. The phone had turned itself off when impacting the ground, but we didn’t dare try switching it on until it was dried out good and proper. In the mean time the David saga had been ongoing – decision on his flight out fluctuated such that at one point he had a flight ticket bought for him, and then half an hour later they were getting a refund for it as it was decided he was not in a fit state to fly. Frustating, trying to post this again. Wow Guys. What a great time you are having, and entertaining for us back home. Fabulous scenery, exciting adventures and dramas. Great photos too. Shame about the biker(s). Too bad his adventure is over. Will this swing future voting, I wonder? I’m off to my sister in Spain (by plane!) on Saturday. Seems kinda dull, now! Anyway, keep safe and all the best, Charles.